sushunamir was created by Enki to rescue Inanna from the "Land of No Return." Inanna, Queen of Heaven, was given great gifts by Enki the Wise. Wisdom, justice, love, the sacred women, and the fruit of the vine. The gift that saved her from death Enki fashioned from the dirt beneath his fingernails. A being of light called, Asushunamir. The spell of Ereshkigal, Queen of the Dead, could not possess this luminescent being. Yet she was charmed by Asushunamir's beauty, moved by (he)r voice, amused by (he)r dance. Ereshkigal called for a great feast to be held in (he)r honor; the best wine, the finest meats, the most sumptuous of fruit. Ereshkigal dreamed of taking this beautiful being to her bed, and of keeping her forever with her in the Land of the Dead. 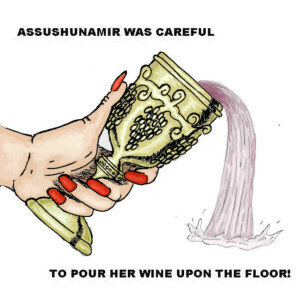 But Asushunamir was careful to pour the wine upon the floor and to eat no food prepared by the servants of Ereshkigal. When the Queen of the Dead grew careless from the wine, Asushunamir asked if (s)he might taste the water of life, kept locked in the cellar. This was the water of which Enki had spoken when Asushunamir came into the world, the water with which one must be sprinkled to pass through the seven gates of Irkalla, the water to renew one's life on earth. Ereshkigal cried out, "Namtar, bring the jug with the water of life. I shall grant the wish of this charming creature." Later, when Ereshkigal fell into a deep sleep, Asushunamir made (he)r way to the lampless cell where Inanna, captive, lay dying. 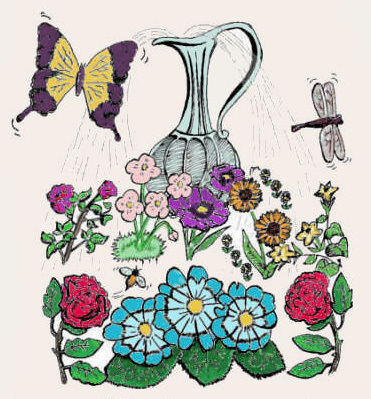 (S)he sprinkled Inanna with the water of life and, as the drops fell on her inert body, Innana breathed easily as a child might breathe and then awakened. 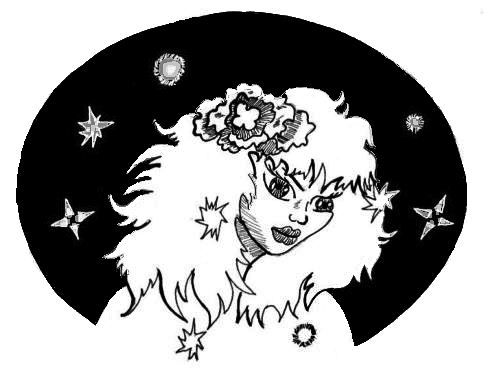 Beautiful and once more flowing with the energy of life, Innana quickly made her way through the seven gates of Irkalla, ascending to earth, causing the flowers to grow and restoring the trees to green. People returned to their planting, their weaving, their making of wine, their love making, and a great feast was held in honor of the return of Inanna. Asushunamir was not as fortunate. Ereshkigal awoke as (s)he was approaching the seventh gate, and neither (he)r beauty, nor (he)r charm, nor (he)r dancing or songs, could extinguish the passion that had turned to hate. ``The food of the gutter shall thou eat,'' cried Ereshkigal, her every word a curse.``The water of the sewer shall be your drink. In the shadows you shall abide, despised and hated by even your own kind.'' Having pronounced the curse, Ereshkigal banished Asushunamir.